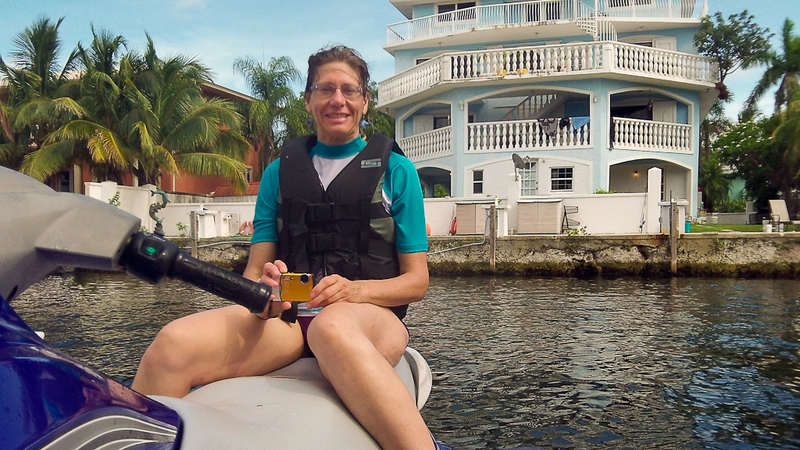 The diving off of Key Largo is great but we also had a lot of fun in town. Live entertainment and new restaurants were two themes of the week. Eileen and I both liked the hotel. This was my second stay at the Courtyard Marriott at mile marker 100. 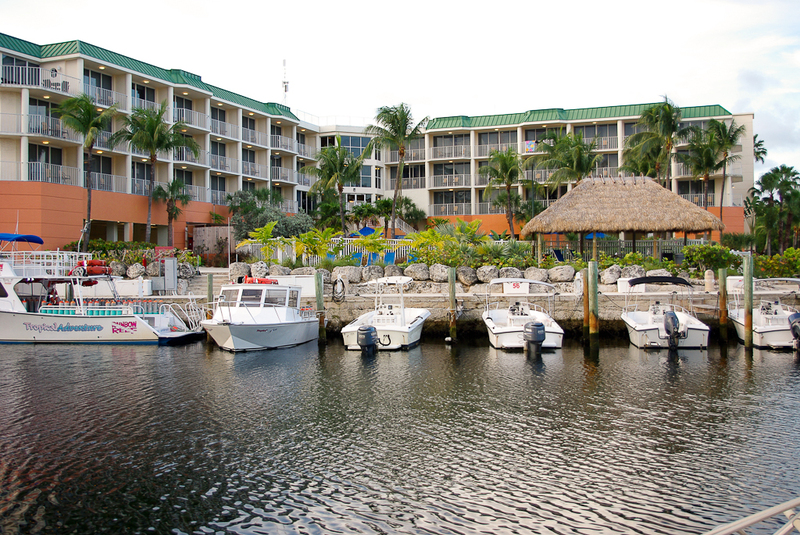 One advantage of the hotel is that it’s located right next to the Rainbow Reef dive boats and not far from Coconuts restaurant. This year we had a 3rd floor room facing east. 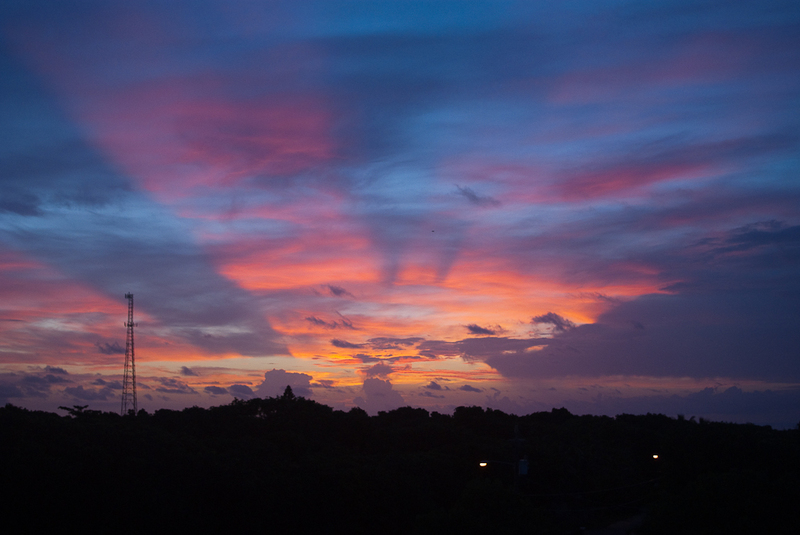 On Sunday morning we woke to an impressive sunrise outside of the balcony door. This was the first trip I have been able to enjoy the sunrise like this. 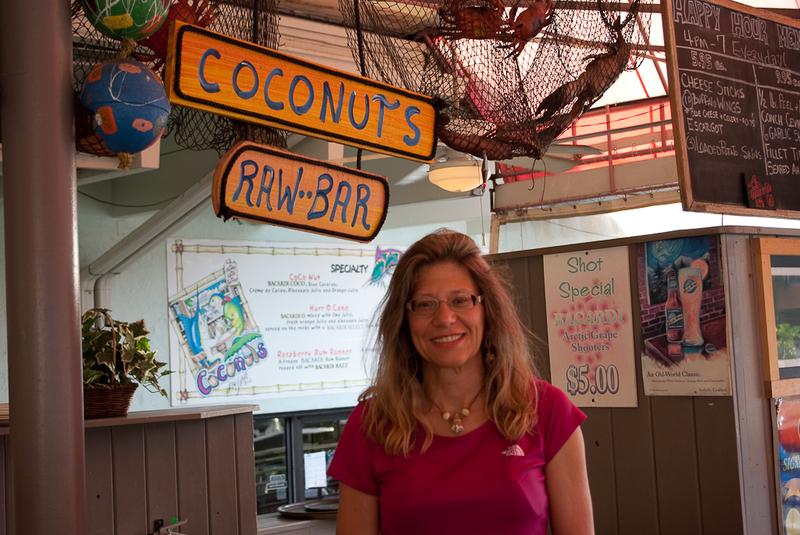 I have been going to Coconuts at the Marina Del Mar Hotel since my first trip to Key Largo in 2005. It’s close to all four hotels near the “fishing village” at mile marker 100. This means it’s in walking distance, which is nice after you have had a few (or a few too many). 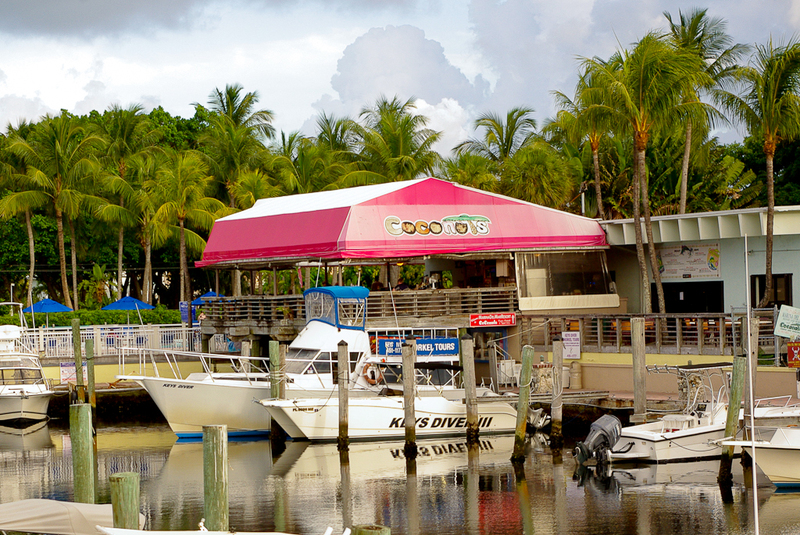 Coconuts has an outdoor dining deck and a bar under a large tent. Happy hour is from 4pm to 6pm. In addition to drink specials you can get appetizer specials from the raw bar. We enjoyed our share (and then some) of peel-and-eat shrimp from the raw bar during the week. 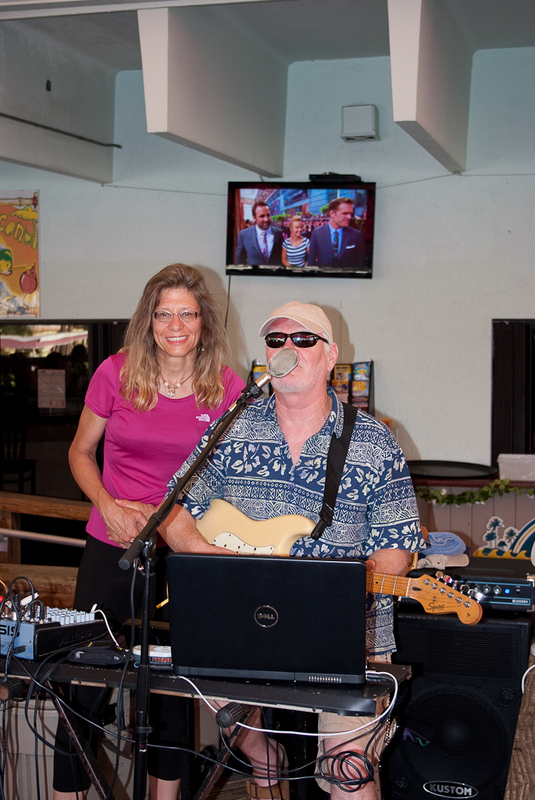 They have nightly live entertainment on the deck from 6 to 9pm. I was pleased to see that some of my favorite musicians from years past were still playing on the deck. Kim Bankston at Coconuts. Photo by Eileen Moran. I just discovered that he has published three CD’s which can be purchased at CD Baby.com or on iTunes. A long time favorite entertainer at Coconuts is Bobbe Brown. Bobbe plays a lot of classic rock and singer songwriter hits from the 60’s and 70’s. He tells the crowd to, “Request your favorite songs”. However he seems to play many of my favorites without a requests, which is really cool. 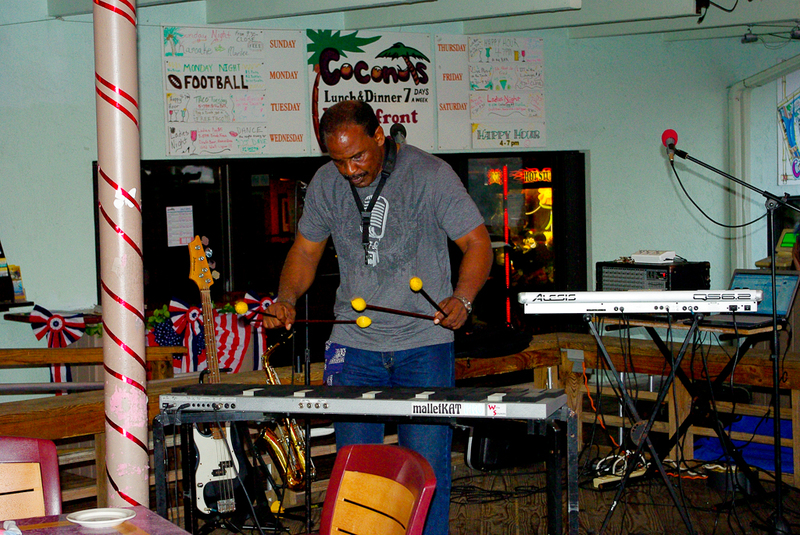 He often jokes that he is required by contract to play Jimmy Buffet songs. I suspect he says this for the benefit of the locals who are probably sick of the songs. However I like Buffet’s hits and Bobbe does a great job playing them. It seems right to hear some Jimmy Buffet songs while in the Keys. 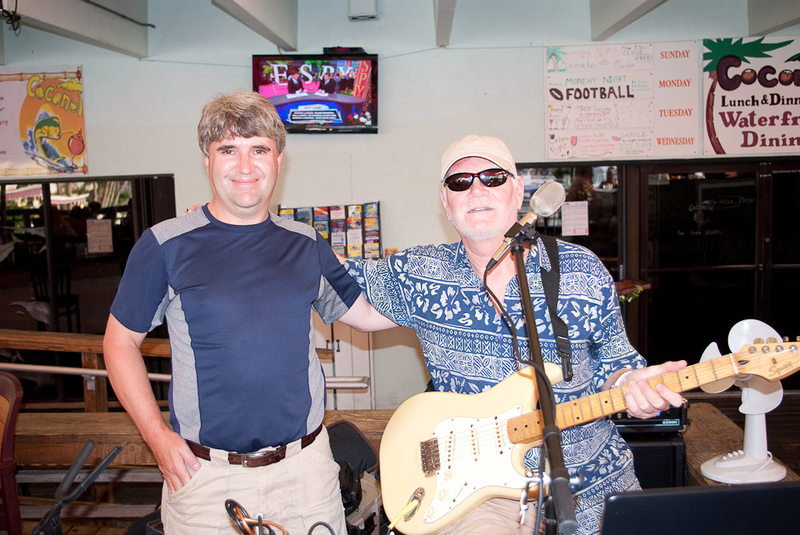 Mark with Key Largo musician Bobbie Brown. 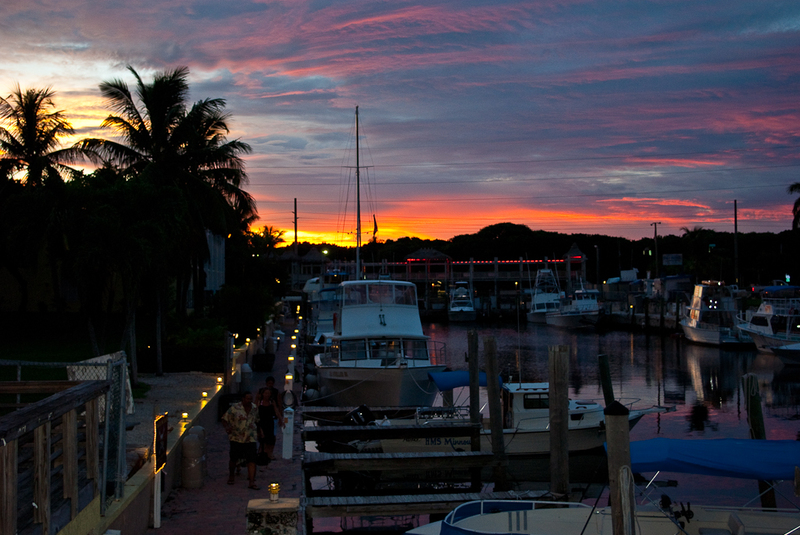 We caught this nice sunset from the Coconuts bar. The sunset was even better since we were at a bar, enjoying good food and drinks while listening to good live music. The Key Largo Conch House came highly recommended by several friends that live in Key Largo. This is a place I had wanted to go since my 2011 trip to Key Largo. The Conch House is close enough to the hotel so that we could walk there. 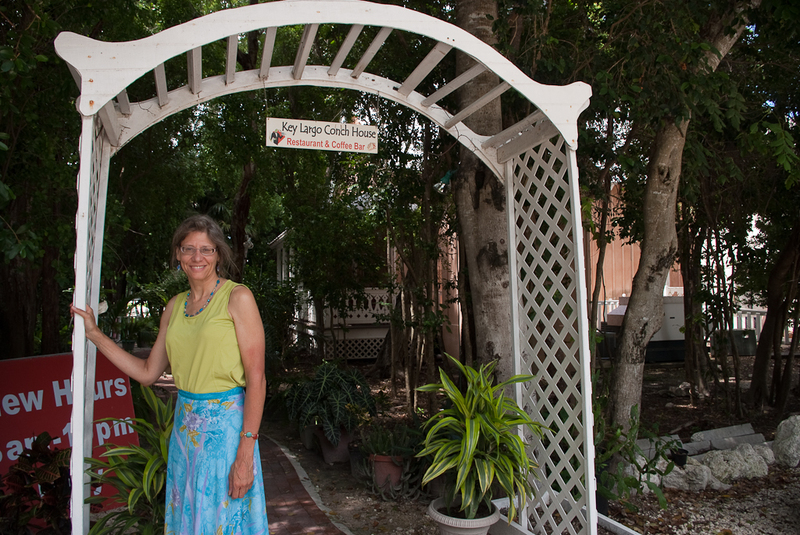 The Key Largo Conch House is a small one room restaurant with outside seating on the porch. The daily sangria special is a treat. My favorite is the Very Berry sangria followed by the Star Fruit sangria. Eileen got a frozen smoothy drink that is tasty. Of course we had to try their award winning conch chowder. I also enjoyed a piece of their award winning Conch House key lime pie with a glass of milk. A large flat screen TV inside the restaurant was showing a fantastic HD video featuring many of the best dive sites in the upper and middle keys. It was cool to see some of the sites we had recently been to while eating and relaxing. Mark at the Conch House near the man vs. Food banner. 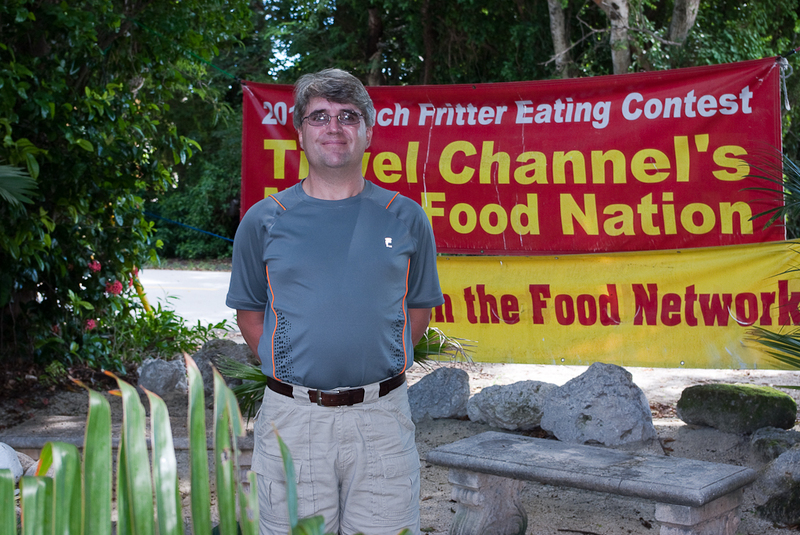 The Conch House is featured in an episode of Man vs. Food Nation. Host Adam Richman tried the Conch House conch fritter eating challenge. Naturally I had to get an order of the same fritters.I have never had a fritter before and was not sure what to expect.I discovered a conch fritter was conch mixed with vegetables mixed with flour, eggs and milk then deep fried. It was served with a really good dipping sauce. The Conch House fritters had a faint curry taste and smell. There were good but I could see how they could fill you up fast. The place is surrounded by lush trees, plants and flowers teaming with birds and lizards. 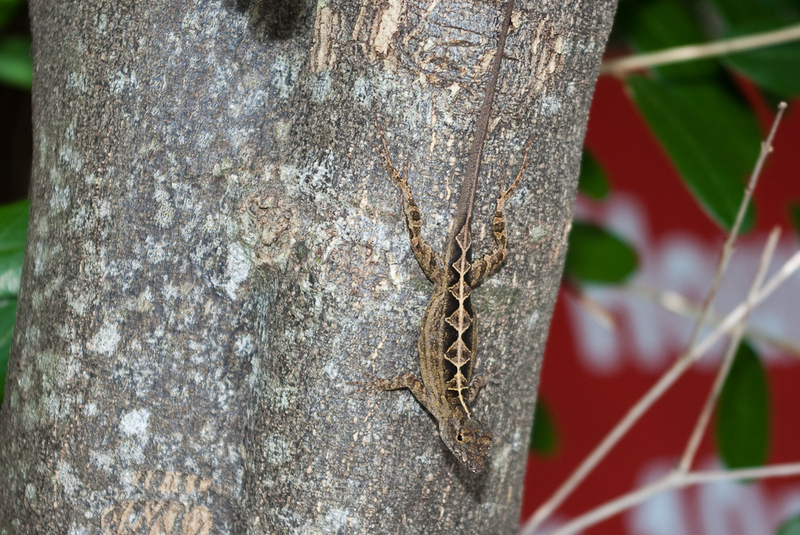 On one of our visits we spotted this small Brown Anole lizard watching us from a tree. Eileen was able to get pretty close for a photograph before it darted off. Since this article is about fun as well as food I have to mention our jet ski rental experience. 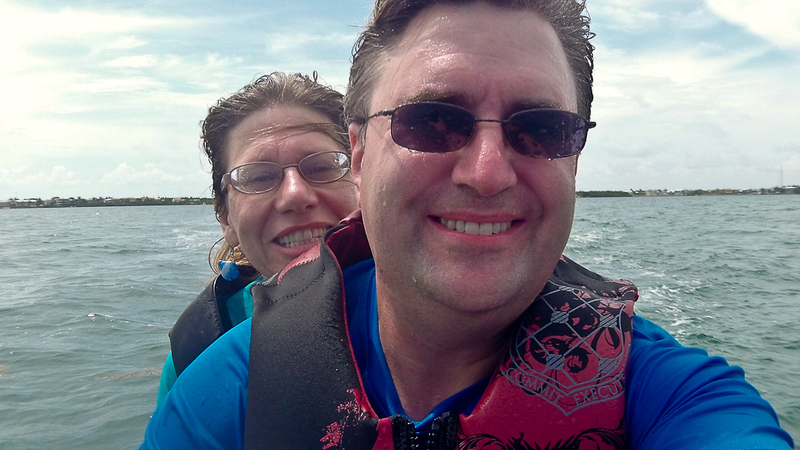 I had rented a jet ski down in Islamorada on a previous trip and had a blast. This time I tried Keys Skis. Keys Skis is located just down the road from our hotel at Key West Inn. The rates were among the lowest in the immediate area. We went out the boat canal along Ocean Blvd and Ocean Cay to the ocean side of the island. We were allowed to ride in an large area between the boat channel and shoreline for an hour. I had the jet ski up to about 30 mph at one point. We both got totally soaked. I even got some video footage from the experience. Key Largo is also home to the African Queen. 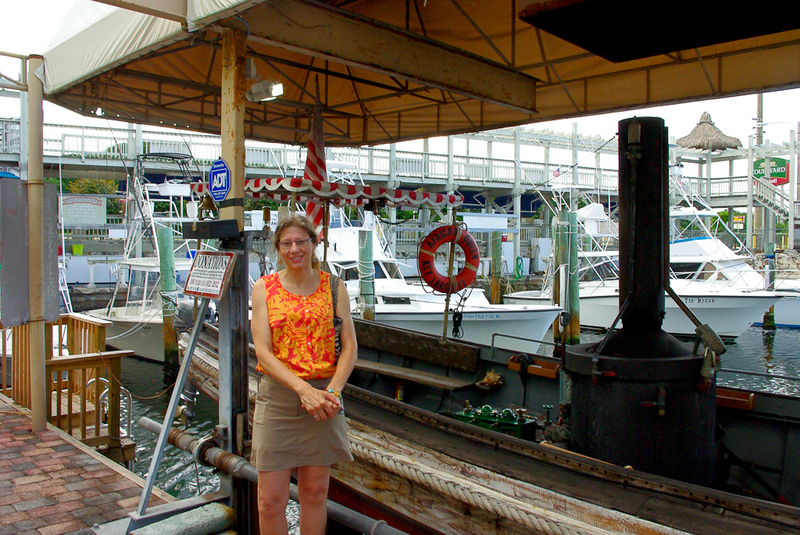 It is the actual boat used in the movie staring Humphrey Bogart and Katharine Hepburn. During the last few years I had noticed the boat was showing its age. During this trip I was happy to discover that a local businessman, Captain Lance Holmquist and his wife Suzanne, had undertaken the job to restore the boat. They have done a wonderful job! You can even go out on the boat for a short cruise now. The boat is now powered with an outboard motor, there is a fund-raising project underway to restore the boiler to power the boat. 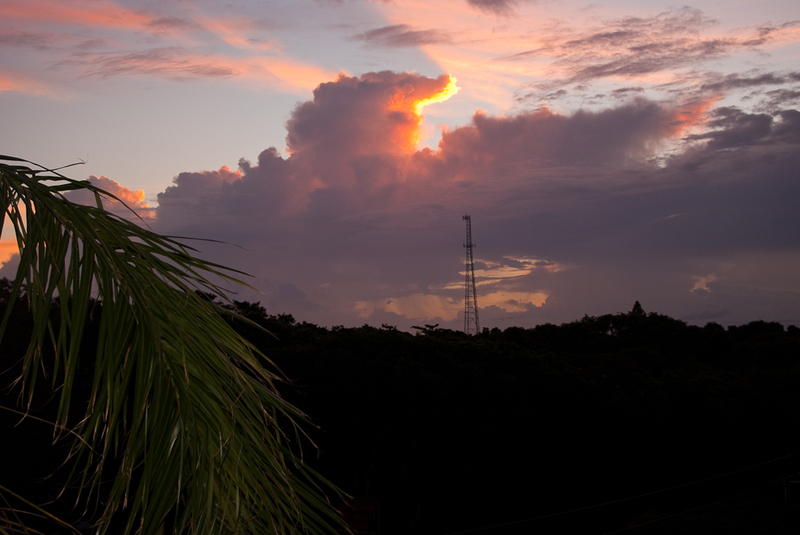 On Friday the 13th we were treated to another amazing cloud formation and sunrise from the balcony. Sadly our stay ended on July 14th when we flew back to New Hampshire. We both hope to go back to the Keys soon. 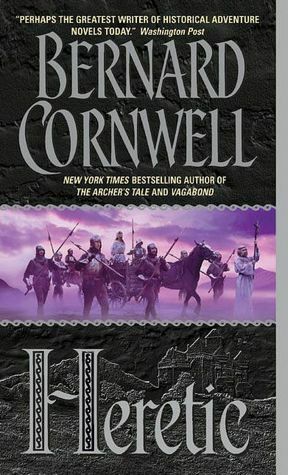 I recently finished the third book in Bernard Cornwell’s Grail Quest series. 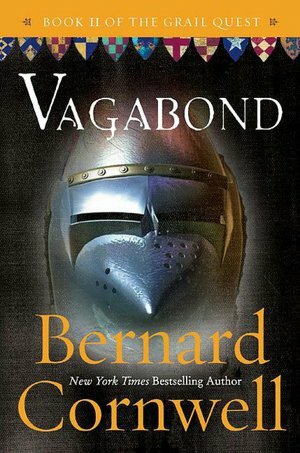 I was hooked on the series just one chapter into The Archer’s Tale and purchased Vagabond and Heretic. 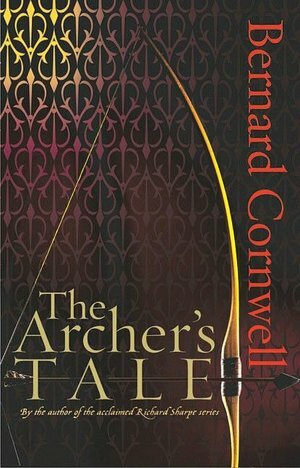 The Archer’s Tale starts in 1342 as the reader is introduced to Thomas of Hookton. On Easter morning of 1342 Thomas is guarding the church relic, which was the spear that “Saint George used to kill the dragon.” French raiders invade the village, killing most of the villagers including Thomas’ father, who was the village priest. They steal the spear and head back to their boats. He promises his dying father he will get the spear back. Thomas escapes but not before killing four of the invaders with his longbow. This event starts Thomas on a career as an archer with the English forces serving in France during the 100 year war. During his service in France Thomas learns his family were said to be Cathars and had once possessed the Holy Grail. It was rumored that his father had escaped France when the Cathars were destroyed and had taken the Grail to England. On one level the series is about a quest to find the Holy Grail. One another level the series is about a turning point in history. The English longbow is a weapon that changed the balance of power during the 100 year war. About.com authors write, “It was during the Hundred Years’ War (1337–1453) that the longbow became legend after it played a key role in securing the great English victories at Crécy (1346), Poitiers (1356), and Agincourt (1415).” In the book The Archer’s Tale Thomas take part in the Battle of Crecy. Thomas and the English archers illustrated “the effectiveness of the English longbow, used en masse” ( From Wikipedia – Battle of Crecy). The effectiveness of the English longbow, “was proven against the horses of the armored knights, contrary to the conventional wisdom of the day which held that archers would be ineffective and be butchered when the armored units closed in.” ( From Wikipedia – Battle of Crecy) The knight and horse was no longer the dominant force on the battlefield. 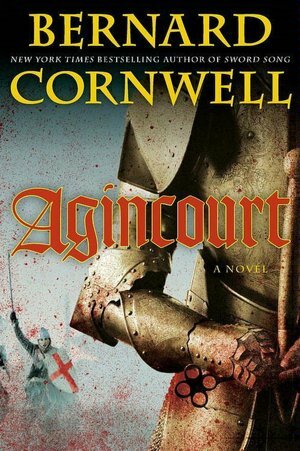 I recently purchased the book Agincourt by Bernard Cornwell, which is not part of the Grail Quest series yet still takes place during the Hundred Year War. Like the Grail Quest series, the main character is an archer. Nicholas Hook participates in the battle of Agincourt where the tactics and use of the English longbow turned the tide of the battle. The plot concept of a quest for the Holy Grail illustrates the Medieval practice of venerating religious relics. Throughout the Grail Quest series and the Saxon series the craze to acquire and venerate religious relics is evident. Characters put great faith in the authenticity of these relics. Modern people would label these items as obvious fakes. It just goes to show how different Christianity of the middle ages was to the modernized “western” version of the religion. The 4th book in the Grail Quest series, titled 1356, is scheduled to be released on September 24th, 2012. Based on the title, I would not be surprised if Thomas ended up participating in the Battle of Poitiers. As mentioned above, Poitiers is another battle where the English longbow was decisive in the outcome of the battle.